The dictionary defines politics as activities that relate to influencing the actions and policies of a government or getting and keeping power in a government. The definition also includes the opinions that someone has about what should be done by governments. As anyone who has a job or is a member of an organization knows, politics is not isolated to governmental organizations. Virtually all organizations have people who are trying to gain and keep power and who are trying to influence the actions and policies of their organization. Organizational politics can be constructive or destructive, depending on the motives and techniques used and whether the politics are aligned with the goal of achieving the organizations stated desired outcomes. The Holistic Organizational Effectiveness Survey (HOE survey) includes a question about the effectiveness of the organization in eliminating organizational silos and internal politics as barriers to organizational effectiveness. The HOE survey uses a 5-point rating scale where 5 = Effective, 4=Somewhat effective, 3=Neutral, 2=Somewhat Ineffective and 1=Ineffective. The overall average for all of the 265 responses received is a very low rating of 2.74, indicating that most organizations have a very significant opportunity to eliminate organizational silos (fiefdoms) and to reduce unproductive politics. How would you rate your organization’s effectiveness in eliminating organizational silos and internal politics as barriers to organizational effectiveness? What needs to be done in your organization to eliminate the silos and politics? Failure of organizations to identify, assess and quantify potential risks and then take action to mitigate the risks can lead to situations that can result in their significant or catastrophic failure, harm to their reputation and possible injury/death. Sometimes the causes of the problems are faulty processes or equipment, managers/employees that make bad decisions or that take excessive risks, suppliers that do not perform or customers that misuse products. Sometimes risks come from external sources. Often unethical behavior and/or poor judgment are at the center of the risks. Many of the types of risks are common to all industries and to government. With few exceptions, c-suite executives and Boards are to blame for not identifying and dealing with risks. Often they create the culture and make the decisions that cause the failures. It is very common to be complacent or to ignore risks. CEO’s are busy and typically rely on other senior leaders to identify and deal with risks. Some of these directly-responsible leaders are arrogant and/or ignorant regarding identifying and dealing with important risks. Prior to Arthur Andersen’s failure, there is no way that their then CEO or anyone else would have thought that the firm’s failure was possible and that the firm would fail soon. Likewise, in 2012 shortly before the JPMorgan Chase London Whale trading losses surfaced, it is inconceivable that CEO and Chairman Jamie Dimon or his Board would have thought such a trading loss was possible. After all, they had sophisticates risk software and enterprise risk management processes in place with a large staff and a supposedly competent senior manager in place protecting the Bank against such rogue trades. In some cases government regulations come into play. Regulations don’t work when regulators are ineffective and people do an end-run around the regulations. Is your organization assessing and managing risks effectively? How do you know? Is your organization at risk of a significant risk incident or catastrophic organizational failure? How do you know? Does your organization conduct a comprehensive annual Enterprise Risk Survey to identify and quantify potential risks across the organization, including a broad assessment of internal and external risks? Highly effective Boards enhance the effectiveness of their organizations in many ways including selecting a highly effective CEO, providing guidance and advice to the CEO, making sure the organization is acting in the best interests of shareholders/stakeholders, reviewing and approving major plans and initiatives, compensation, audit results, risk, etc. In the U.S., companies and not-for-profit organizations are incorporated at the state level. The incorporation laws vary greatly by state with some states being significantly more lax in its requirements and compliance. It is this reason that many companies incorporate in Delaware. Activist investor Carl Icahn and Jeffrey Sonnenfeld, the Senior Associate Dean for Executive Programs & Lester Crown Professor in the Practice of Management at Yale University are two of the more vocal critics of dysfunctional Boards. They talk often about the failures and impact of dysfunctional Boards. While some Boards are highly effective, many are only marginally effective or not effective at all. There are many reasons why some Boards are dysfunctional. How effective is your organization’s Board? How is your Board positively and negatively impacting your organization? Which of the above reasons for Boards being dysfunctional apply to your organization? The overall rating for all survey participants and questions is 3.45. 90.9% of survey respondents have overall average ratings below 4.5, indicating significant opportunities exist for increasing HOE in most organizations. It is clear that most organizations have a very significant opportunity to increase their Holistic Organizational Effectiveness. 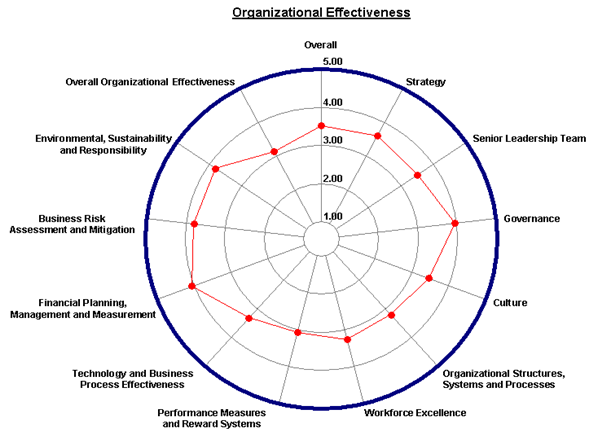 What do you think your organization’s overall holistic organizational effectiveness rating is? What needs to be done to make your leadership team aware of the opportunity to assess and then increase holistic organizational effectiveness? In many ways public sector (governmental) organizations face the same Holistic Organizational Effectiveness issues that businesses, not-for-profit and other types of organizations face. Their ability to consistently achieve their desired outcomes depends on the effectiveness of their leadership, governance, people, culture, strategies, mission clarity and appropriateness, information technology, processes, organizational structures, suppliers, enterprise risk assessment and mitigation, financial management, sustainability and corporate social responsibility efforts, innovativeness and other key drivers of holistic organizational effectiveness. Most governmental organizations at the national, state, county and local levels face additional challenges not typically faced by businesses. These include often having elected people or political appointees as top leaders (often lacking subject matter and leadership expertise and experience in the functions/services performed ), various constraints on firing and replacing poor performing employees, and less accountability to customers (constituents). Budgets and changes in the mission of governmental organizations often come more from political considerations and ideology than from real world requirements for change. In the Holistic Organizational Effectiveness Survey the overall average rating for governmental organizations is 3.14, a low rating. The following table compares the overall ratings for all industries combined and the results from the Government sector. Whatever country you live in, how would you rate holistic organizational effectiveness at the national, state/province, county and city/town levels? What might be done to increase awareness of holistic organizational effectiveness in the public sector and the benefits that can be achieved (e.g. budgetary, better outcomes, greater efficiency, increased customer/constituent satisfaction, etc.) for governmental organizations and the public? In your country, state/province, county and city/town what needs to be done to increase holistic organizational effectiveness? U.S healthcare spending is out of control. It currently accounts for approximately 18% of the U.S. GNP (gross national product) and it is growing annually. Per capita healthcare spending in the U.S. is much higher than in any other country while our overall outcomes fall short. It is not clear how the Affordable Healthcare Act of 2012 (Obama Care) will impact total healthcare expenditures. It is designed to reduce overall costs. Some people think it will increase costs. What is clear is that much more needs to be done to address both healthcare costs and the overall quality of healthcare and health outcomes. U.S. health care spending was $2.7 trillion in 2011, or $8,680 per person. Health spending grew 3.9 percent in 2011, the same rate of growth as in 2009 and 2010. National health spending in 2011 was 17.9% of the U.S. GNP (gross national product). Other Professional Services: $73.2 billion. Includes establishments that provide services such as physical therapy, optometry, podiatry, and chiropractic medicine. Other Health, Residential, and Personal Care Services: $133.1 billion. Includes expenditures for medical services that are generally delivered by providers in non-traditional settings such as schools, community centers, the workplace, ambulance providers, and residential mental health and substance abuse facilities. Prescription Drugs: $263.0 billion in 2011, following a historically low growth rate of 0.4 percent in 2010. Durable Medical Equipment: $38.9 billion. Includes items such as contact lenses, eyeglasses and hearing aids. Other Non-durable Medical Products: Retail spending for other non-durable medical products, such as over-the-counter medicines, medical instruments, and surgical dressings, reached $47.0 billion in 2011. Spending in this category increased at the same rate in both 2010 and 2011, at 4.0 percent. Medicare: Medicare spending, which represented 21 percent of national health spending in 2011, grew 6.2 percent to $554.3 billion, an acceleration from growth of 4.3 percent in 2010. Contributing to the increase in 2011 was faster growth in spending for skilled nursing facilities and physician’ services, as well as an increase in Medicare Advantage spending growth. Medicaid: Total Medicaid spending grew 2.5 percent in 2011 to $407.7 billion, a deceleration from 5.9-percent growth in 2010. This was partly due to slower growth in Medicaid enrollment of 3.2 percent in 2011 compared to 4.9 percent-growth in 2010. Federal Medicaid expenditures decreased 7.1 percent in 2011, while state Medicaid expenditures grew 22.2 percent—a result of the expiration of enhanced federal aid to states in June 2011. Private Health Insurance: In 2011, private health insurance premiums and benefits each increased 3.8 percent—accelerating from growth in 2010 of 3.4 percent and 2.7 percent, respectively. The net cost ratio for private health insurance – the difference between premiums and benefits as a share of premiums – remained unchanged from 2010 at 12.3 percent. Private health insurance enrollment increased 0.5 percent in 2011 after declining each year 2008-2010. Even so, on a per enrollee basis, private health insurance benefits grew 3.2 percent in 2011, decelerating from growth of 4.6 percent in 2010, and was partly a result of additional enrollees aged twenty-six and under who gained coverage under the Affordable Care Act. Out-of-Pocket: Out-of-pocket spending grew 2.8 percent in 2011 to $307.7 billion, an acceleration from growth of 2.1 percent in 2010 that reflects higher cost-sharing and increased enrollment in consumer-directed health plans. The federal government financed 28 percent of total health spending in 2011, a substantial increase from its share of 23 percent in 2007. Meanwhile, the shares of the total health care bill financed by households (28 percent), businesses (21 percent), state and local governments (17 percent), and other private revenues (7 percent) all declined during the same time period. America’s healthcare-system-induced deaths are the third leading cause of death in the U.S., after heart disease and cancer. The U.S. spends $1.8 trillion a year in medical costs associated with chronic diseases such as diabetes, heart disease and cancer, and all three are linked to smoking and obesity, the nation’s two largest risk factors, according to the America’s Health Rankings report. Smoking is the No. 1 preventable cause of death in the U.S, accounting for about 440,000 deaths annually. For every person who dies from a smoking-related disease, 20 more people suffer with at least one serious illness from smoking. In 2000–2004, cigarette smoking cost more than $193 billion (i.e., $97 billion in lost productivity plus $96 billion in health care expenditures). Information published in 2005 documented that secondhand smoke costs more than $10 billion (i.e., health care expenditures, morbidity, and mortality). Americans have gotten heavier and that is significantly impacting healthcare costs. Average adult Americans were about one inch taller in 2002 than in 1960, but nearly 25 pounds heavier than they were in 1960, according to the Centers for Disease Control and Prevention (CDC). There are many more people handling medical paperwork in doctors’ offices, hospitals, nursing homes, health insurance companies, etc. than there are medical professionals treating patients (doctors, nurses, etc.). Americans overall are over-medicated. For example, millions of Americans rely on drugs to lower cholesterol and triglycerides rather than eating a healthy diet and exercising regularly. In addition to preventing cardiovascular problems, eating a healthy diet and getting regular exercise also helps to prevent obesity, cancer and diabetes, which is now at epidemic levels. The potential overall cost of painkiller abuse is more than $70 billion a year. Pill addicts who shop around for doctors to score prescriptions cost insurers $10,000 to $15,000 apiece annually. The annual U.S. cost in lost productivity is $42 billion. The annual criminal justice cost is $8.2 billion. The U.S. has annual healthcare fraud of between 3%-12% of GNP ($75 – $250 billion). In addition to fraud, the Government Accounting Office reported that in 2011, Medicare and Medicaid paid an annual $65 billion in “improper payments.” It defines “improper” to include payments that are made in error — not fraud, but wrong just the same. The U.S. has the most-costly and best healthcare system in the world … if you’re rich and can afford the best medical insurance and costs not covered by medical insurance, or if you happen to work for a company that provides good comprehensive medical insurance to its employees. For everyone else it is costly and much less effective. For millions of Americans, healthcare simply is not available, although Obama care is making affordable medical insurance available to a significant portion of the uninsured people. How would you rate the effectiveness of the U.S. healthcare system? Do you agree a holistic approach is needed for fixing the U.S. healthcare system? What should be done to increase emphasis on prevention of health problems? What role can each person play? Providing health insurance is a significant burden for many companies including the insurance and administrative costs and the need to have healthcare expertise. Should there be an approach that gets employers out of providing medical insurance? At a total cost of $2.8 trillion/year, there are many large vested groups fighting hard to maintain the healthcare status-quo. Healthcare insurance companies, pharmaceutical companies, pharmacy companies, medical device companies, doctors, nurses, hospitals, nursing homes, healthcare benefits companies and other groups see risks to their bottom lines if the key healthcare problems are seriously addressed. Try to get people to eat healthier diets and the food industry and certain farmers (e.g. beef and dairy industries) will react to thwart the efforts. How should we deal with this important issue? Quantisoft’s team-based 360 leadership surveys are having considerable success in identifying leadership strengths and weaknesses of individual leaders and of entire leadership teams. The data is highly effective for strengthening leadership programs. We customize the survey questions to meet the specific needs of organizations and their leadership teams. 1. Conduct 360 leadership surveys for entire leadership teams rather than just one or a small number of leaders who you feel need to strengthen their leadership effectiveness. For example, we just completed the third set of leaders for a financial services company with approximately 300 employees. The first round included the senior leadership team, the second round included all mid-level managers and the final round included all first-line/supervisor level managers. 2. Do not have people providing feedback identify themselves by their level (e.g. peer, reporting to, level above, etc.) – this makes people more comfortable in providing honest, comprehensive feedback. 3. Provide each leader with their own set of comprehensive ratings and comments reports including all responses aggregated and each person’s feedback on an anonymous basis. 4. Provide a full set of the reports for each individual leader to HR and to the top people in the organization (CEO, President, etc.). Also provide them with comprehensive aggregate reports identifying areas of leadership strength and weakness for the entire leadership team. Aggregate reports include a listing of the leadership team’s competencies in descending rating order and a list of the leaders in descending overall rating order. 5. Senior leaders, HR, OD and Training use the team and individual 360 leadership feedback to develop appropriate actions for strengthening the leadership team’s and each individual’s leadership effectiveness. Actions include training, coaching, etc. The survey results are also very useful for identifying ways to strengthen leadership programs and for identifying strong candidates for promotion and succession planning. Quantisoft recently conducted 360 Leadership Surveys for a financial services organization with approximately 300 employees. The survey questions were customized to meet their environment. The survey was conducted in three separate groups, one at a time. The senior leadership team was done first, mid-level managers were done next and the supervisor level was done last. The following tables include the results (overall ratings) for the 16 mid-level managers and by department. There is a very large range of leadership effectiveness among the 16 leaders, ranging from a high of 4.56 to a low of 3.08. There also is a very large range in leadership effectiveness by department, ranging from a high of 4.48 to a low of 3.08. Not shown here, there is a very large range of overall ratings by survey question. Reports identify the questions (leadership characteristics and competencies) and which leaders need to strengthen their effectiveness by taking personal action and by receiving help to become more effective leaders. Reports also identify training, development and coaching/mentoring needs for individual leaders and for groups of leaders. Follow-up surveys typically done within 3 – 12 months assess progress and for weaker leaders, whether they should continue in their current position. Employee surveys, customer satisfaction surveys and other types of surveys commonly conducted for businesses and other types of organizations provide a wealth of information about strengths, weaknesses and opportunities for improvement. This is especially so when the surveys are well-designed and comprehensive, covering a broad range of pertinent topics. Quantisoft has been conducting surveys for organizations since 1999. Many of our customers have made significant changes based on survey findings and our recommendations, and they have achieved very positive results as measured by annual follow-on surveys. Some organizations fail to take meaningful action based on survey results and they typically achieve little or no improvement. Provide senior level support for conducting surveys and for taking action and getting results from the survey findings. Consider having a survey company conduct your surveys. They will provide important useful suggestions and guidance and outside, objective perspective in terms of what questions to ask, performing analysis of the survey results and making recommendations for taking action and making needed changes. Read all of the survey comments and review the survey ratings in detail. Make sure you know and understand the ratings and comments/suggestions made by employees. Share the results with your organization’s leadership team and all of your managers and supervisors. Also share at least some of the pertinent results with all employees. Create action plans based on the survey results. Some actions/initiatives are likely needed on an organization-wide basis while others are best made at the department level. Make sure you identify the right people to create the action plans and to lead the needed change projects/actions. Conduct the surveys periodically to assess progress and to identify new problems and opportunities that may have surfaced since the last survey. Quantisoft conducts comprehensive employee surveys for many organizations across many industries. Our surveys include questions about the effectiveness of performance reviews and about ongoing performance feedback. More often than not employees comment that their performance reviews are not effective, that they include inaccurate information about the employee’s performance and that the performance reviews are not linked to salary increases. Employees often say managers play favoritism in deciding salary increases rather than basing the increases on actual performance. Some organizations do not hold their managers accountable to do the performance reviews on time and some not at all. In their survey comments many employees say that it is more important to provide honest ongoing feedback to employees throughout the year than it is to perform an annual performance review. The problem is that many organizations want and need a rational approach for determining salary increases and they feel that annual performance reviews are the best approach for evaluating all employees using a standard performance measurement process. In reality, the performance management process is designed and executed poorly in many organizations and it does not provide the desired results. Some performance review processes mix the evaluation of employee skills and competencies with the evaluation of actual performance. Unfortunately, many organizations do not use their performance reviews to identify training and development needs and do not provide needed training/development based on the performance reviews. We also find that many organizations do not provide training and useful guidelines for managers to prepare effective performance evaluations and to conduct effective performance review meetings with employees. The bottom line – performance reviews are a significant source of frustration for many employees and for managers preparing and delivering the reviews. The good news is that some organizations do a good job with performance reviews. We also find that when our employee surveys identify the need to improve the performance review process including specific areas for improvement, many of our survey customers do make important changes to the performance review process. Ideally, the top-two listed questions above should have received overall ratings close to 5. Who wouldn’t expect ethical behavior and customer safety to be top priorities that are well executed? Likewise, while some businesses and other types of organizations rate highly in all or most of the customer-related questions included in the HOE survey, it is clear that most organizations need to increase their focus on customers and do a much better job of identifying and meeting customer expectations and executing their customer service, customer support processes, etc. How would you rate your organization’s customer focus and effectiveness in executing well for your customers, whether you work for a business, not-for-profit organization, governmental entity or any other type of organization? Would your organization benefit from conducting a customer satisfaction survey and then taking action based on the survey results? In the early 1990’s two things surfaced that focused organizations on systemic learning and the need to become “learning organizations”. These were Peter Senge’s book, THE FIFTH DISCIPLINE – The Art & Practice of the Learning Organization and the introduction of the balanced scorecard by Robert Kaplan and David Norton. The ratings indicate that most organizations are not doing a good job of creating the environment needed for organizational learning and executing on that learning. How effective is your organization at learning and executing on that knowledge to increase the organization’s performance and competitiveness? What needs to be done to strengthen your organization’s learning abilities and who needs to lead the way? Few organizations achieve sustained success year after year and decade after decade. Very few of the businesses that were leaders in their industry 100 years ago are still in existence today. Almost all that are still in business experienced periods of great success and periods of mediocrity along the way, sometimes coming close to failure. Some including GM actually failed and came back from bankruptcy. There are four key drivers which are being done very well at times when organizations are highly successful. These drivers are mission, leadership, culture and innovation. When any one or more of these organizational effectiveness drivers are not being done very well, organizational effectiveness and performance start to drop, sometimes very significantly. Yes, there also are many other drivers of organizational effectiveness (eg. workforce effectiveness, risk management, technology effectiveness, sales and marketing effectiveness, process effectiveness, supply chain effectiveness, etc. ), but their effectiveness all rely on the four key drivers to be effective. Mission – Whether an organization is a business, not for profit, governmental or any other type of organization, the mission needs to be clearly defined and make sense. There needs to be a strong reason for the organization to exist in terms of meeting the needs of a defined group of people or entities (businesses, etc.). The mission needs to be clearly defined and communicated to both employees of the organization (or the organization’s volunteers) and the organization’s constituents. The mission may need to change as constituent needs or desires change, or in reaction to disruptive products or technologies. Leadership – The effectiveness of an organization’s top leaders and the people they put in other important leadership positions is critical to achieving and sustaining high levels of organizational effectiveness and success. The top leader has enormous leverage in terms of putting in place the conditions necessary for making and keeping the organization effective and achieving desired outcomes in the short and long term. 360 leadership surveys are a great tool for gathering anonymous feedback for use in boosting the effectiveness of leaders at all levels of the organization. Culture – Organizational culture is a broad issue. It includes integrity, how people treat each other, the extent to which employees or members share and are passionate about the organization’s mission and meeting its desired outcomes, commitment to organizational and individual learning, and many other aspects. A strong, healthy culture is essential for achieving sustained organizational success. Innovation – Innovation can mean different things to different organizations. To some, it is staying ahead of the competition with new and better products or services that people or businesses want or will want when they learn about these products and services. To other organizations innovation is identifying and implementing better ways to do the things they do to execute their mission. Quantisoft recently conducted a comprehensive employee survey for an organization with 125 employees. The survey has over 6o questions which assess the effectiveness of a broad range of issues that impact organizational and employee effectiveness and performance. The survey ratings and comments identified some areas of strength and a larger number of significant weaknesses. During the webinar meeting in which I presented the survey executive summary report to the organization’s senior leadership team, one of the senior leaders asked if I could identify the three most important things they should do as a result of the employee survey. I answered that there are clearly identified priorities, but that there are considerably more than just three important things that need to be done. The need to strengthen trust between leaders at all levels of the organization and employees. The need to increase respect for members of the senior leadership team and for some managers at various levels of the organization. Employees’ desire for increased compensation based on work contribution and performance. The need for less costly health insurance, better dental and vision insurance, and other enhanced benefits. Addressing heavy workloads and related stress. The need for more staff and less overtime, and everyone doing their fair share of the work. Improving the effectiveness of the less-effective and “difficult” managers. Strengthening inefficient technology and processes, and providing better access to information. The need for greater emphasis on customers, customer service and quality. The need for more effective communications between and within departments, and from senior management with more openness to listening to employees. Expanding advancement opportunities and hiring from within the organization. Strengthening the organizational culture and its ability to nurture innovation and significantly increase employee morale and engagement. Increasing teamwork and collaboration within and between departments with a focus on getting everyone to understand and support the organization’s mission, vision and values, and achieving the organizations objectives. The need for more and better new-employee and ongoing training and development. Increasing senior-level decision makers’ knowledge of what is going on at the worker level enabling them to make more informed decisions. Many of our survey clients have us conduct their comprehensive employee surveys annually. Some achieve great progress year after year while others make little or no progress. The organizations that make great progress don’t just deal with the top three problem issues. They use Quantisoft’s survey results recommendations and create and implement comprehensive action plans. The organizations that achieve little or no progress are the ones that address only a small number of the issues identified by the survey, and their commitment to taking action and achieving results is limited. The 2013 NJOD Learning Community Annual Sharing Day (ASD) Conference on May 7th was excellent. This was NJOD’s 15th annual ASD and its best yet, with well over 200 people attending. Congratulations to the NJOD Board for putting together an outstanding program. I found Peter Block’s keynote presentation particularly interesting and on target. Peter shared many interesting experiences and his insight about issues that have been challenging organizations and their leaders for many years. Like previous years, it was great to see friends and meet people in the OD and HR arena. Every business leader knows the importance of “hard measurements” including things like financials, number of customers and customer demographics and buying history, inventory data and other things that can be measured accurately and that directly or indirectly represent bottom-line performance. Less emphasis is usually placed on measuring “soft mesurements” by most leaders. Soft issues or measurements include the measurement of feelings, opinions, experiences, attitudes, behavior and any other things that are somewhat subjective, but that strongly influence the actions of employees, customers and other groups. Soft measures are often as important as hard measurements because soft measurements are key drivers of the hard issues. Customers make purchasing decisions based on reputation, personal experiences, hearsay, recommendations, personal likes and dislikes and other soft issues. Likewise, employees become engaged or disengaged based n soft issues. Soft issues drive employee and customer loyalty and turnover. Many of the most important business risks are also based on soft issues. The importance and potential impact of most risks are subjective, but they can me measured, assessed and mitigated. One of the most effective and lowest cost ways to measure and quantify soft issues is to conduct online organizational effectiveness surveys, employee surveys (employee engagement surveys / employee satisfaction surveys), IT customer satisfaction surveys, customer satisfaction surveys and enterprise risk surveys. Ratings provide the quantification needed to identify strengths, opportunities, threats and problems. Verbatim comments provide information and insight for identifying why things are going well or not, and what needs to be done to implement positive change. The payback can be huge and the cost is minimal. Business process effectiveness is a key driver for achieving holistic organizational effectiveness. Processes used by employees and customers can be highly efficient and effective, or they can be cumbersome and cause frustration, delays, quality and reliability problems, poor timeliness and low productivity. Ineffective processes can require extra inventory to compensate for problems. Ineffectiveness processes also hurt competiveness in terms of lost customers, reduced productivity and other problems. Achieving high levels of holistic organizational effectiveness requires putting in place highly effective business processes. Michael Hammer’s 1990 article in the Harvard Business Review launched Business Process Reenginering (BPR). Since then many organizations have undertaken BPR initiatives, some of which have long been ended while other have continuously used BPR to ensure that current and new processes are highly effective. Six-sigma quality and other approaches have also been used to implement highly effective business processes. Quantisoft’s comprehensive employee surveys, customer satisfaction surveys, holistic organizational effectiveness surveys and IT customer satisfaction surveys typically include questions about process effectiveness. Even after years of BPR, Six-sigma quality and other initiatives, our surveys almost always identify significant opportunities to increase business process effectiveness for employees, customers and suppliers. Shortfalls in IT application design and implementation, insufficient training, poor process design and other reasons typically are the causes of ineffective business processes. The Holistic Organizational Effectiveness Survey asked people to rate and comment on how effective their organizations are at identifying and dealing with low-performing managers and employees. The overall rating for all survey responses is a very low 2.65 where 5 = Effective and 1 = Ineffective. Quantisoft includes this question in many of the customized employee surveys we conduct for organizations across the U.S. and internationally. We often see similar low ratings in many of the employee engagement surveys / employee satisfaction surveys. The comments received from survey participants typically explain the low ratings. Failure to effectively identify and deal with low-performing managers and employees is very frustrating to co-workers, who end up having to do extra work to compensate for the weak performers. It shows up in poor quality and customer service, lower overall productivity and lower employee morale. The solution to this costly problem includes making managers at all levels of the organization aware of the need to proactively identify and deal with poor performers, doing a better job of hiring high-performing employees and managers and dealing with poor performers on a timely basis. Innovation is vital to the sustained growth and viability of companies in industries including high-tech, biotech/pharmaceutical, energy, etc. New products sometimes create disruptive technologies and new categories (e.g. iPad and iPhone) and new approaches (e.g. hydraulic fracturing to boost oil and natural gas production) are sometimes game changers. For organizations in other industries and sectors, innovation is important more for enabling them to meet customer expectations, to stay ahead of the competition and to remain efficient. This is even true for governmental organizations. The survey uses a rating scale of 1-5 where 5 = Effective and 1 = Ineffective. These low ratings indicate that most organizations are not doing enough to innovate to stay ahead of their competitors nor are they creating the culture and providing resources needed to support innovation. Quantisoft’s employee satisfaction surveys/employee engagement surveys assess the culture and conditions needed to encourage and support innovation. The Holistic Organizational Effectiveness Survey includes eight questions that directly assess various aspects of the organization’s focus on and support for customers. Many of the other questions indirectly assess issues impacting customers. These are the eight questions that specifically focus on customers. The rating scale is 1-5 where “5 = Effective” and “1 = Ineffective”. We consider overall ratings (average rating for all survey participants) of 4.50 and higher to be good ratings and ratings of 4.75 and higher are excellent. All eight of the “customer focus” questions are significantly lower than 4.50 with most being very significantly below 4.50. The highest rated customer focus question assesses the organization’s effectiveness in fostering a culture of ethical behavior with employees, customers, suppliers and the community. While this is the highest rated customer focus question, it clearly is a low rating in the context of the need for organizations to be “highly ethical” from a legal, reputational, organizational sustainability/survivability, customer and employee morale and other key drivers of organizational effectiveness and performance. An overall rating of 4.20 for “making employee and customer safety a top priority always” is in reality a very low overall rating. Any rating less than 4.75 – 5.0 should be considered unacceptable. While it is not possible to guaranty 100% safety for customers and employees in all situations, any organizational that does not make employee and customer safety a top priority always sooner or later will likely experience significant injury and possibly death of employees and customers. Failure of local, state and federal governments to properly inspect and fix deficiencies in the nation’s roads, bridges and other infrastructure has resulted in bridge collapses and other tragic incidents and related deaths. The 2007 I-35 Mississippi River Bridge collapse in Minneapolis is just one example. Carnival Cruise Line’s tragic 2011 Costa Concordia disaster, the 2010 Horizon Deepwater Gulf Oil tragedy caused by inadequate focus on safety by BP and Transocean, and Massey Energy’s Upper Big Branch mine disaster in 2010 are some of the more high-profile examples. Unfortunately there have been and will continue to be countless other unnecessary tragedies due to “making employee and customer safety a top priority always”. The other customer focus questions should also be of major concern for most business, governmental and other types of organizations. 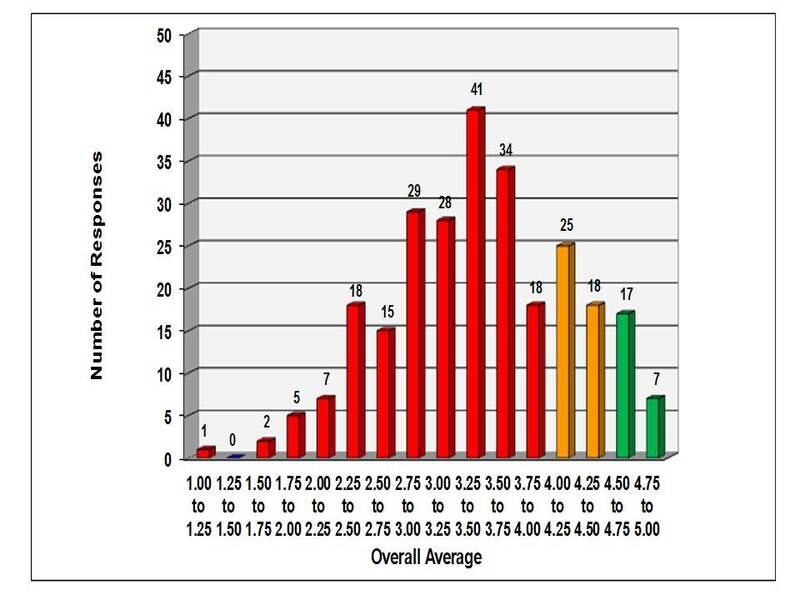 The overall averages are ow, indicating that most organizations are not addressing these issues well and that the outcomes are impacting performance. Aligning strategies, people, structures, systems and processes to meet work and customer demands, at 3.29 and implementing employee and customer friendly business processes to enable efficient/effective transactions, at 3.17 are particularly low overall ratings. Conducting holistic organization effectiveness surveys, employee surveys / employee engagement surveys and customer satisfaction surveys and then acting on the results enables organizations to significantly strengthen their customer focus and outcome effectiveness. Employee satisfaction drives employee engagement which in turn drives employee and organizational performance. Quantisoft has experienced these interdependencies in the employee satisfaction surveys/employee engagement surveys we have conducted for businesses and other types of organizations since 1999. Workforce effectiveness is a key component of Holistic Organizational Effectiveness and achieving high levels of employee engagement is essential for building a highly-effective, energized workforce. The Holistic Organization Effectiveness Survey includes two questions that directly address employee satisfaction, engagement and performance, and many other questions that indirectly measure these issues. Following are the two survey questions and the very low overall ratings they received. The rating scale is 1-5 where “5 = Effective” and “1 = Ineffective”. While some organizations conduct employee satisfaction and/or engagement surveys, many do not, and their focus on achieving high levels of employee satisfaction and engagement are often limited or non-existent. Further, while some organizations that conduct employee satisfaction surveys/employee engagement surveys do a great job of using the survey results to make changes resulting in large gains in employee satisfaction, engagement and performance, many others have mixed results at best. Sometimes organizations and their leaders ignore survey results, take limited action and sometimes they even become defensive, instead choosing to challenge the validity of the survey results. Some leaders prefer to shoot the messenger bringing bad news (low survey ratings and negative comments from employees) than it is to take ownership of problems and to then take appropriate action. Leaders of the best-performing organizations conduct employee surveys, customer surveys and other types of surveys and take aggressive action to achieve positive results. They realize they can learn a lot from employees and customers and failing to do so results in a major missed opportunity. Shortfalls in information technology and business process effectiveness are significantly impacting the Holistic Organizational Effectiveness (HOE) of most businesses, governmental, not for profit and other types of organizations. Today, organizations rely heavily on technology and business processes to make their people more effective, to perform many mission critical tasks, to provide services to customers, to store and access information and to perform many other important actions. When information technology and business processes are planned, implemented and supported inadequately or ineffectively, organizational effectiveness is significantly impacted. Employee productivity and the ability of employees to perform their jobs effectively is impacted. Customer service and support are also impacted, as is many other aspects of running the organization effectively. The Holistic Organization Effectiveness Survey takes a broad look at information technology and process effectiveness. The survey rating scale is 1 – 5 where 5 = Effective and 1 = Ineffective. The overall average rating of 3.32 and the HOE Survey ratings for Technology and Business Process Effectiveness are very low (see below), indicating that information technology and business process effectiveness is seriously impacting organizational effectiveness at most organizations. These HOE Survey findings are very much in line with the findings of comprehensive IT customer satisfaction surveys Quantisoft conducts for businesses and other types of organizations. We also see evidence of significant shortfalls in information technology and business process effectiveness in many of the employee engagement surveys and customer satisfaction surveys we conduct. Business processes that are inefficient, impacting productivity, process timeliness, quality, customer service/support, information access and availability, etc. Insufficient, ineffective or no IT customer training provided for new applications and major changes in applications, and for new employees. Poor rollout of new applications. Applications that are cumbersome to use, that lack needed functionality, etc. Slow networks that are often difficult or impossible to access when working from remote sites. Old and underpowered desktop and laptop computers that are very slow, that take several minutes to boot up and that crash often. Ineffective/inadequate processes for replacing desktop/laptop computers, printers, scanners, smartphones, office/desktop software. Ineffective/inadequate communications from IT and between IT and IT customers. These clearly are not the HR/OD issues that are often thought of when thinking about organizational effectiveness, yet IT and business process shortfalls have as great an impact on organizational effectiveness at many organizations as the typical HR/OD issues, and possibly even greater impact. How effective are your organization’s information technology delivery and support, and business processes? Does your organization’s senior leadership team have an accurate understanding of how effective (or ineffective) your organization’s ITdelivery and support, and business processes are? How are information technology and business process shortfalls impacting your organization’s HOE, workforce effectiveness, customers, ability to compete effectively and bottom line? What needs to be done to increase the senior leadership team’s understanding of the costs associated with IT and business process shortfalls? Is your organization getting enough value for the money being spent? Is your organization spending too little on information technology and business processes? Can you get more value for the technology and business process dollars spent by doing it better, or do you need to spend more? In summary, achieving high levels of information technology and business process effectiveness is critical to achieving holistic organizational effectiveness in any organization. 54% of the Holistic Organizational Effectiveness Survey (HOE Survey) responses came from people in HR and OD (Organizational Development) roles. The other 46% of responses came from a wide range of functional areas (e.g. general management, IT, sales, marketing, manufacturing/operations, finance, legal, internal consultants, etc. ), from external consultants (15.5% of all responses) and from people in academic positions (2% of all responses). The HOE Survey includes 97 questions that assess a broad range of holistic organizational effectiveness drivers. HR and OD typically are directly or indirectly responsible for many of the HOE issues (e.g. workforce excellence, culture, senior leadership development, organizational structures/systems/processes, HR strategy, performance measures & reward systems, etc. ).The overall rating for all 265 survey participants and questions is 3.45 on a scale of 1 – 5 where 5 = Effective and 1 = Ineffective. The overall rating for responses from OD is 3.49 and for HR the overall rating is 3.37. How would you rate your organization’s overall HOE, and the ratings for each section and question within the HOE Survey? What are your organization’s HOE gaps (i.e. how much below optimal HOE levels is your organization)? What would it take to make your organization’s senior leadership team aware of the HOE concept and the potential benefits for them and for your organization? What can you do to make your leadership team aware of HOE? Do your organization’s HR/OD functions have the expertise, ability, positioning and credibility needed to lead a long-term HOE improvement process for your entire organization? The Holistic Organizational Effectiveness Survey found that most organizations are falling far short in doing the things necessary to create a highly effective workforce. Achieving workforce excellence is a dream more than a reality. The survey includes a section on workforce effectiveness as well as numerous questions in other sections of the survey that also impact workforce effectiveness. The ratings for the Workforce Excellence Section are presented below. The survey uses a 1 – 5 rating scale where 5 = Effective and 1 = Ineffective. All of the “workforce excellence” ratings are very low, indicating a large opportunity exists for significantly increasing workforce effectiveness in most organizations. The ratings are similar across many industries, governmental and not for profit organizations across the U.S. and in other countries. The workforce excellence findings are in line with the findings Quantisoft sees in the employee engagement surveys / employee satisfaction surveys we conduct for companies and other types of organizations. Most organizations are underinvesting in their people and they are not effective in proactively building a strong workforce. Most organizations are especially weak at dealing with issues that are barriers to achieving a highly effective workforce such as identifying and dealing with low-performing managers and employees. The Holistic Organization Effectiveness Survey Report also includes other issues that impact workforce effectiveness and excellence. The effectiveness of senior leadership, IT support/execution and corporate culture are some of the other drivers of workforce effectiveness included in the report. How effective is your organization’s workforce? What are your workforce’s strengths and weaknesses? What measurements does your organization have in place to assess workforce effectiveness and the actions and resources used to strengthen workforce effectiveness? Does anyone in your organization have an idea of the drag that deficiencies in organizational effectiveness may be having on your organization’s ability to achieve your desired outcomes and to boost your bottom line? Considering all of the workforce excellence drivers included in the Holistic Organizational Effectiveness Survey, what should your organization do to significantly increase workforce effectiveness? The Holistic Organizational Effectiveness Survey (HOE Survey) assesses how effective an organization is in doing the things and establishing the environment and conditions necessary to achieve the outcomes the organization intends to produce. The HOE Survey includes 12 sections with 97 questions in all. Each of the questions represents an important driver for achieving HOE. The average overall rating for all questions and all survey participants is 3.45 on a 1 – 5 rating scale where 5 = Effective and 1 = Ineffective. While some survey participants rated their organization’s HOE significantly higher or lower than the average rating for all respondents, the overall average HOE rating of 3.45 is a very low rating. Ideally, any organization’s HOE rating should be between 4.5 and 5.o and as close to 5.0 as possible. The following profile graph shows the HOE gaps for each of the 12 HOE survey sections and for the aggregate overall survey results. Gaps are the difference between the ratings being on the outer circle (rating = 5.0) and the actual rating. The HOE profile graph shows the areas of relative strength (none of the HOE Survey sections received high overall average ratings) and relative weakness. The HOE Survey Report (pdf) includes profile graphs for each of the individual survey sections, displaying the HOE gap for each of the survey questions within the respective survey sections. Why take a Holistic approach to measuring and achieving Organizational Effectiveness? The HOE Survey takes a holistic approach to assessing Organizational effectiveness because there are many important issues that drive organizational effectiveness, organizational health and an organization’s ability to achieve its “desired outcomes”. Focusing on some or all of the HOE drivers that HR and OD typically focus on is simply not enough. Effectiveness of senior leadership, governance, innovation, technology and business processes, suppliers, enterprise risk management (ERM), environmental sustainability, financial planning/management/measurement and other factors is critical for achieving desired organizational outcomes. Having relatively low HOE levels in any of the 12 key HOE driver areas (survey sections) can seriously impact an organization’s ability to achieve its desired outcomes and it can ultimately become the cause of the organization’s failure. What do you think your organization’s HOE gaps are? How do you know? How much more effective would your organization be if it assessed HOE and then implemented an ongoing HOE improvement process? What would it take to make your organization’s senior leaders aware of the HOE concept and to buy into and implement a long-term process for achieving HOE excellence? What additional resources are needed for your organization to implement a HOE improvement process, getting all functions within the organization actively involved? Which functional area within your organization is best positioned to drive your organization’s HOE improvement process? What are the next steps in making your organization’s leadership team aware of HOE and then starting up a continuous HOE improvement process for your entire organization? Is Your Senior Leadership Team Driving or Restricting Your Organization’s Success? The “Senior Leadership Team’s Effectiveness” is probably the single most important section of the The Holistic Organizational Effectiveness Survey (HOE Survey). To a great extent, the senior leadership team is responsible for all of the issues included in the HOE Survey. A highly effective leadership team, especially the CEO, is essential for achieving holistic organizational effectiveness. More often than not, great (highly effective) leaders achieve great success for their organization, their customers/constituents, their employees and their share/stakeholders. Weak (ineffective) leaders usually achieve mediocre results or failure. How would you and your colleagues rate the effectiveness of your organization’s CEO and your senior leadership team? What can be done to make your CEO and senior leadership team aware of their effectiveness as perceived by your organization’s people? Would they be open to learning the results and making changes in how they lead, or would they be defensive, challenging and rejecting the results if they are not very positive? Thinking about the HOE Survey leadership effectiveness questions, what needs to be done to significantly increase the effectiveness of your organization’s top leader and his/her senior leadership team? In most organizations there is a very large gap in performance between the top and bottom performers in every job in the organization, from the C-suite down to the lowest levels of the organization. Top sales people, whether they are selling cars, pharmaceutical products, office equipment or anything else typically sell several times more than the least effective sales people. Likewise, the top performing Engineers, Scientists, IT, Marketing, HR, Finance, Operations, Audit, Supply Chain and other people in professional positions out-perform the weakest people by a wide margin. Even in the simplest jobs, the gap in output between the top and bottom performers is often 50 – 100%. We call this gap in performance the “People Performance Gap”. The “People Performance Gap” impact is greatest at the C-suite level. A highly effective CEO can lead an organization to great success while an ineffective CEO can easily bring an organization to mediocrity or even failure. (“People Performance Gap” article). Most organizations don’t do enough to understand and address the “People Performance Gap”. In many of the employee engagement surveys, IT customer satisfaction surveys, external customer surveys Quantisoft conducts, we see significant problems due to ineffective and difficult managers and people in various positions. The problems impact employee and customer engagement and loyalty, employee and organizational performance and the bottom line. What if anything does your organization do to recognize and deal with the “people Performance Gap”? What is the impact of low-performing people in your organization? How much better could your organization become in terms of achieving desired outcomes by effectively addressing the “People Performance Gap” and workforce effectiveness issues included in the HOE Survey? What needs to be done and who needs to do it for your organization to address the “People Performance Gap” opportunity?